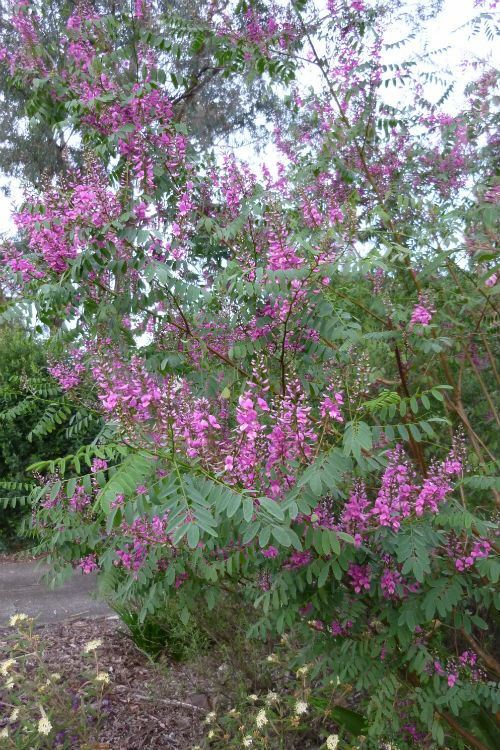 Indigofera australis is a plant referred to by many online sites and gardening books as “underutilised”. It definitely should be grown more often as Indigofera australis has very attractive flowers and beautiful coloured foliage. It is an open erect spreading shrub, widespread in southern Australia from the south-east of Western Australia to north-east Queensland. Indigofera australis is a member of the pea family and grows well in most soils and prefers a semi or dappled shaded position. I planted some of these plants about 10 years ago in my garden in the northern Sydney suburb of Westleigh and they have all grown to about 2 metres high and about 1.8 metres wide. The plant has attractive pink to purplish flowers that appear in late August and flower into October. The flowers contrast well against the pinnate blue green leaves. Reference books advise that they tolerate moderately heavy frosts, however my seed grown plants did not survive the first frost in my daughter’s Southern Highlands garden. Perhaps I did not give them enough time to acclimatise to the colder growing conditions. Maintenance: I have found that Indigofera australis is at its best if pruned from early age to encourage a denser shape. If left to their natural growth, they tend to be a much more open plant. I prune them quite hard, after flowering and try to avoid pruning into very old wood, as I have found there will be no new regrowth. 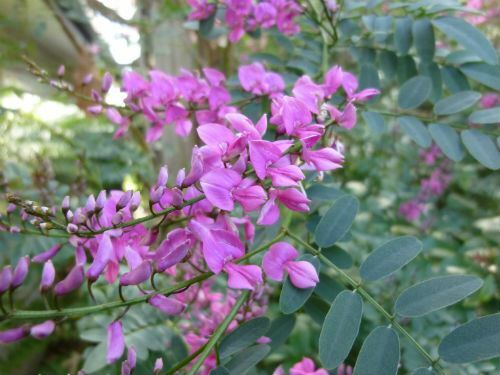 Overall, Indigofera australis is a stunning plant in and out of flower, often available in nurseries and at least one should be in every semi-shaded garden. Indigofera; Neo-Latin for "bearing Indigo". Indigo is a purple dye originally obtained from some Indigofera species. "australis" from the Latin, means "southern", referring to the geographical distribution of the species.